Pinata apples are crisp and juicy. They have a unique tropical taste. They have an inviting appearance of a golden and red delicious apple . This apples is one of our favorites. 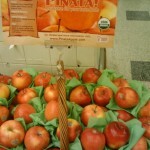 Pinata apples can be used in salads, sauces, baking,poaching and great frozen for a great snack.